Description The collection is a virtual collection. The photographs are in the collections of the Grove Park Inn. The images are largely construction photographs of the Grove Park Inn largely taken by John B. Robinson, a local photographer, and contained in a series of albums assembled by the Inn. The construction of the Inn and many of the associated buildings and landscape details that were added by the builders over a period of years, are included in the some 374 images in the collection. It is one of the most complete construction records for a building in the Asheville area and a visual history of construction practice just after the turn of the century. Source P2005.9.1 ; Virtual collection ; Original material located at the The Grove Park Inn Resort & Spa. Rights Any display, publication, or public use must seek the permission of Special Collections at the University of North Carolina at Asheville. Citation Grove Park Inn Collection (1913- ), D. H. Ramsey Library, Special Collections, University of North Carolina at Asheville 28804. Processed by UNCA Special Collections staff, 2005-12-20 . 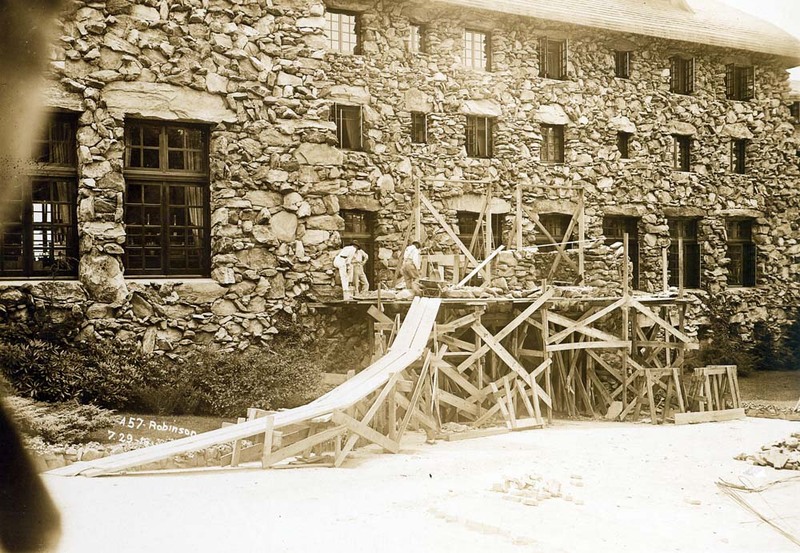 History The Inn was built in eleven months and 25 days from the time the first stone was laid until the day it was declared finished by the builder, E. W Grove and his architect, contractor and son-in-law, Fred L. Seely. It is reported that during construction, some 400 men were involved in the construction process. The Inn was built in five sections that join end-to-end, step terrace-like along the mountain ridge. Native uncut granite boulders quarried from Sunset Mountain form the wall surfaces and chimneys of the inn and the roof is topped with red sloping tile manufactured in Ohio. It appears as a magnificent lodge on Sunset Mountain, its organic form mimicking its natural surroundings. Series Photograph Album #1 - 225 images, not including duplicates. Photograph Album #2 - 63 images, not including duplicates. Photographs Album #3 - 86 images, not including duplicates.